Why are we fascinated with murder? This is the question that crime novelist and producer Peter James asks audiences in the programme of his latest adapted novel; Not Dead Enough. And why indeed? There is something intriguing about felony, villains, and in particular murder. We all watch crime dramas on television, within the click of a button a whole host of thrilling spectacles are available in abundance. And now, Peter James has brought one to the stage. Peter James is one of the UK’s most treasured crime and thriller novelists with his Roy Grace detective novels having sold over 18 million copies worldwide. He has previously adapted his best-selling crime works of fiction into sell-out plays including The Perfect Murder and Dead Simple. Bill Ward (Emmerdale, Coronation Street) takes the leading role as DS Roy Grace. His role is everything you would expect from a no-nonsense, high-octane detective, akin to the cop-dramas of the 90s and early 2000s. Ward’s presence, dominance and command on stage make for the perfect leading detective. Laura Whitmore (Strictly Come Dancing) makes her professional theatrical debut as Cleo Morey. She is best known for her presenting work but Whitmore has all the hallmarks of a professionally trained actress. Stephen Billington (Coronation Street) plays suspected killer Brian Bishop and was spectacularly chilling when he needed to be. Michael Quartey provided the comedic relief as second in command detective Glenn Branson, and Gemma Atkins was the supporting female lead Sophie Harrington. 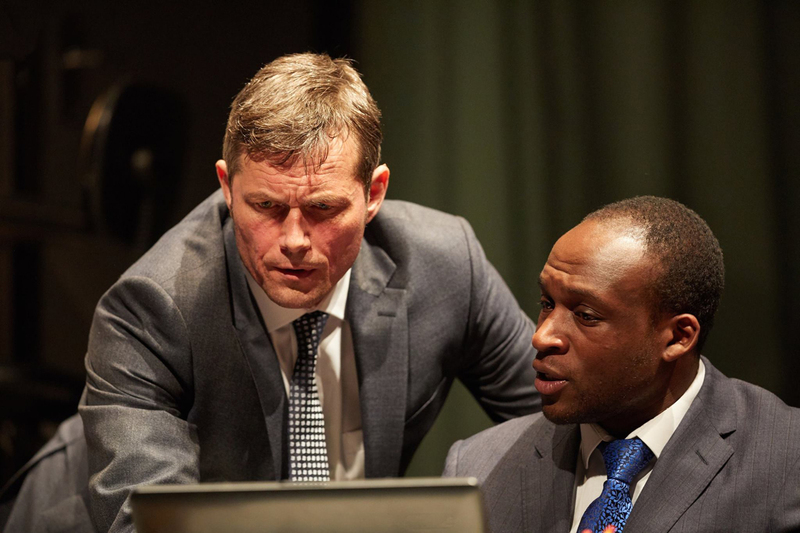 Whilst the storyline and delivery of the play might not match up to the gripping crime dramas we are used to watching, it still provides a night full of twists, turns and edge-of-your-seat moments. The cast deliver the script with full force, and work hard to maintain the unnerving, attention-grabbing atmosphere throughout. The clever set is split into three parts and the different levels make for an interesting aesthetic. If you like crime dramas and are prepared to see a thrilling murder investigation unfold live in front of your eyes then this is a play for you.